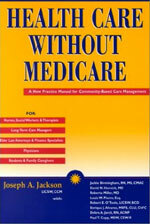 In Health Care Without Medicare, Joseph A. Jackson describes the essential knowledge and skills of Community LifeCare Planning (CLCP). Jackson’s CLCP model offers a new method of practice for community-based care planning and care management for frail-elderly, disabled, and chronically-ill individuals. A student of the health care and long-term care systems, Jackson combines the viewpoints of all the members in the lifecare team − including health care, finance, estate planning, and counseling professionals − to teach a new approach to caring for consumers of the greatest portion of high-tech, institution-based health care.